Recent astronomical surveys have detected many so-called Super-Earths — planets up to 10 Earth masses and potentially with a rocky interior. Many of them orbit their respective stars either far away or very close and some seem to harbour thick molecular hydrogen atmospheres. From an astrobiological point of view this is both a blessing and a curse. At first sight — if you think about Venus, our hellish neighbour with its acidic atmosphere — mainly hydrogen atmospheres seem to be problematic because they would easily enable runaway greenhouse processes and it might be hard to achieve a stable climate as on Earth, which is in general regarded as a requirement for the development of even the most basic life forms. However, the massive amounts of hydrogen could also enable the presence of liquid water on the surface if the planet is outside the zone (planet-star distance) which is traditionally regarded as ‘healthy’! The latter idea is further investigated in Abbot’s paper, in which he is especially interested in whether the presence of simple biological feedback can enable a stable climate over millions of years. 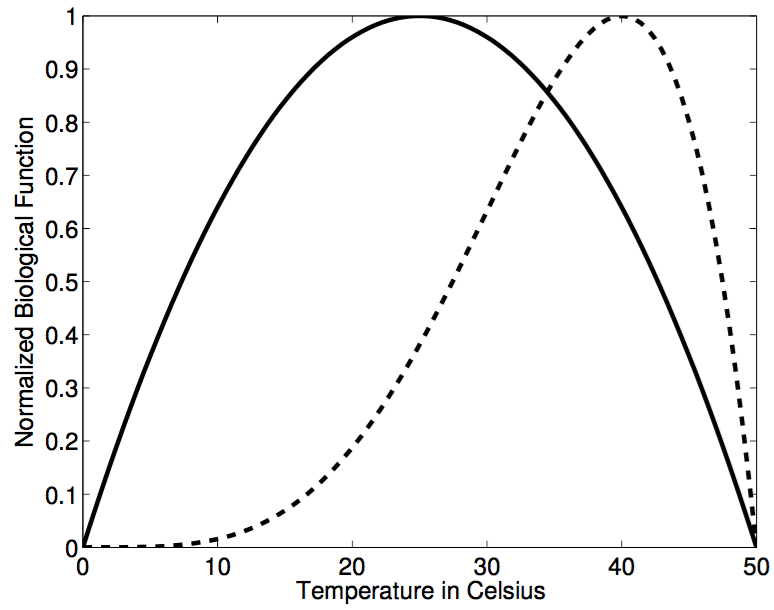 For such a process to occur the chemical back coupling of the biological process (for example, the respiration or metabolism of simple life forms) needs to have a temperature dependence which increases up to a certain temperature and then drops again, like in Figure 1. For a long-term stability coupling of life and atmosphere which enables a roughly constant temperature over millions of years, it is important to understand what happens when there is more hydrogen gain than loss. If there is more and more hydrogen pumped into the system, for example by outgassing from the planetary interior, such as volcanism, then the biology of the planet has to act in a way such that it gains energy from a hydrogen eliminating process, to prevent dramatic increase in hydrogen in the long term (this would increase greenhouse effects, eventually leading to a runaway effect). Now, if any perturbation of the system occurs, like changes in stellar radiation or heat from the interior by radioactive decay, the coupled system needs to be able to somehow compensate these changes. In order to achieve this, the gain in hydrogen cannot be higher than what the biological process can compensate for (see Figure 2). Ok, what does this mean? The setting must be ‘friendly’ enough, such that the biology can compensate for all changes to the usual temperature. For example, if we have simple bacteria metabolising on a planet with active volcanism and out of a sudden the radiation from the star increases, the bacteria have more energy to proliferate. The increased number of bacteria can then account for the increased energy budget and compensate for the changes by lowering the abundances of hydrogen, which in turn decreases the greenhouse effect. 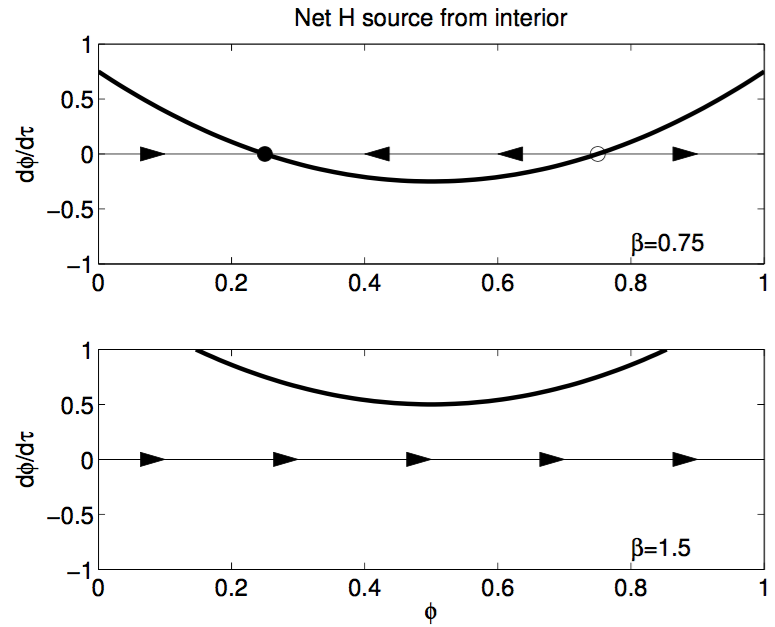 The story for a net hydrogen loss is the exact oppposite. 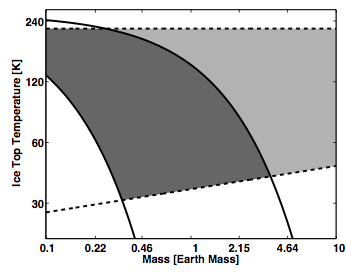 An example would be a planet from which the atmosphere is stripped away by extreme ultraviolet radiation (XUV) from the central star, which for example can be emitted by young M dwarfs. If the planet in sum loses hydrogen, the active biological process on the planet must gain energy from a chemical reaction which adds hydrogen to the system. However, if there is a change and hydrogen is somehow stripped away from the planet the biological process must add more and more hydrogen to keep the equilibrium. The most important outcome of this study is to show that it is in principle possible to sustain a stable climate at very unfavourable conditions. For extreme planet-star distances the presence of liquid water on the surface is usually regarded as unlikely. But even under these conditions the biological back coupling of any form of life and the atmosphere can lead to sustainable life-friendly conditions. However, for this to happen the environment conditions (for example nutrients) need to be balanced and the temperature changes to the system (for example massive volcanism or increased stellar radiation) cannot be too extreme. With upcoming planet surveys it might actually be possible to observe this effect and understand if this feedback loop is happening out there! If we could measure the surface pressure of hydrogen on many hydrogen dominated Super-Earths (which is hard enough) and find that an unexpectedly large number of planets far away from their stars have the correct amount of molecular hydrogen, this would mean that some sort of climate-stabilizing feedback could act on these strange and far-away worlds.